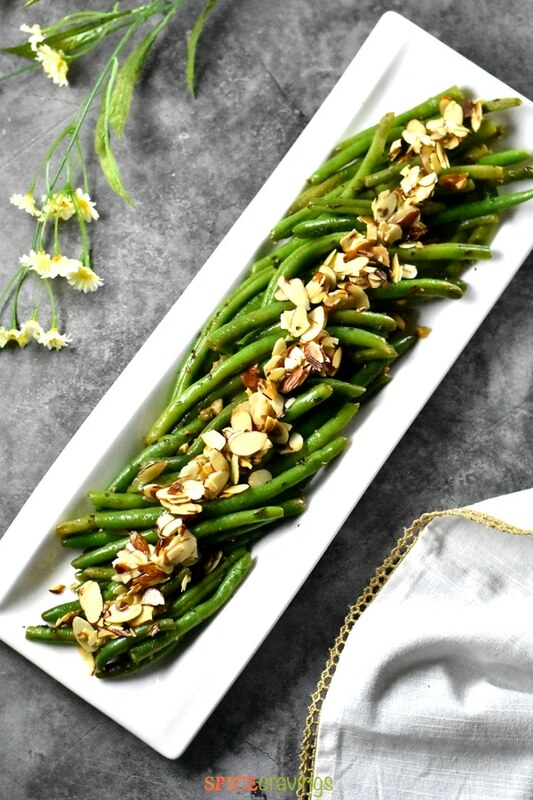 Flavorful and healthy Green Beans Almondine is the perfect side-dish for Thanksgiving or any meal of the year! Fresh crisp string beans are sautéed with olive oil, seasoning, garlic and balsamic vinegar, & topped with toasted almond chips. 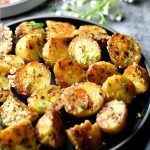 If you’re looking for delicious Thanksgiving sides that are a quick and easy to make, you will love this recipe. 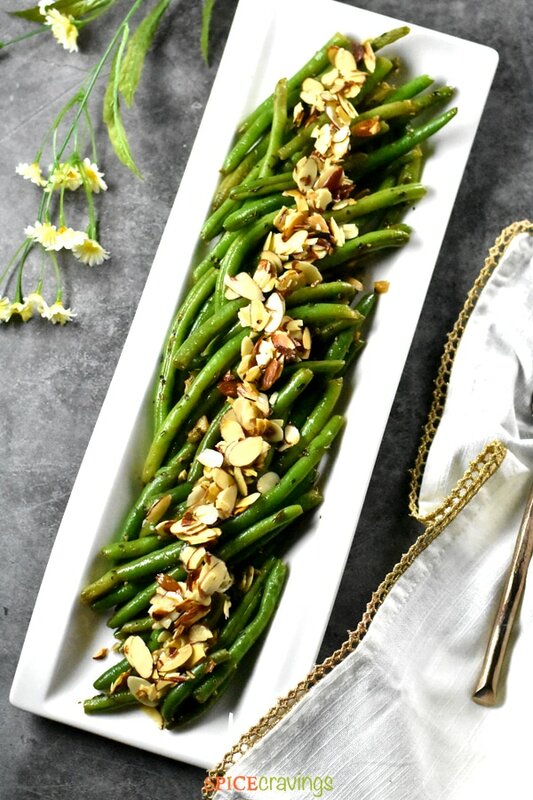 This String Bean Almondine recipe is a great low-calorie, low-carb side-dish that will compliment your dinner spread, without sending you into a food coma. Almondine or Amandine, is a classic cooking method of sautéing in butter and seasoning, and garnishing with toasted almond chips. Basically, it’s a fancier name for a sautéed veggie side. This recipe is a great way to jazz up fresh green beans for thanksgiving or any holiday meal. For years I’ve made the traditional Green Bean casserole for Thanksgiving and holiday dinners, and loved it. 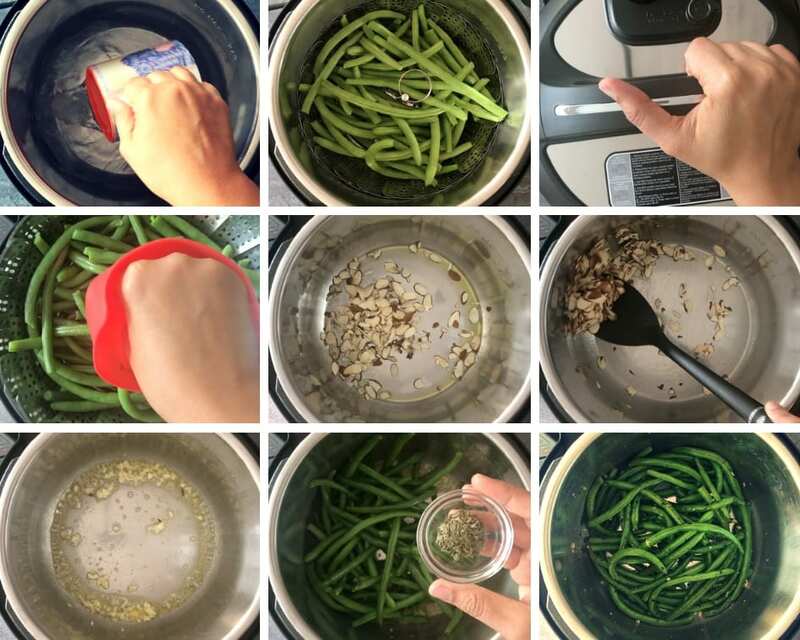 A few years ago, I was experimenting with lighter and healthier green bean sides, and tried this recipe. My family enjoyed it so much that it has become a staple at our thanksgiving dinner since then. The Instant Pot pressure cooker is great for steaming vegetables. Why you ask? ✓It is very easy to customize how cooked or el dente you like your veggies. ✓It’s a hands-free method . I set it and forget about it till it beeps. 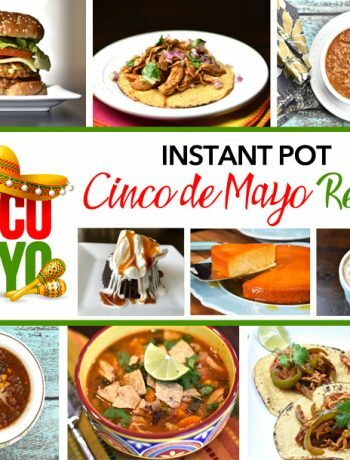 ✭ Add water in the Instant Pot inner pot. 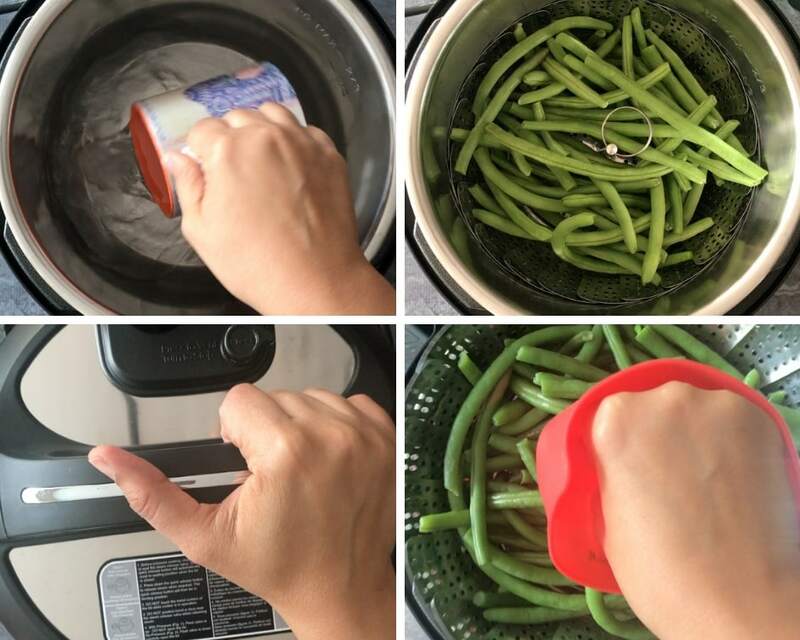 Place the washed and trimmed green beans on the steamer basket. Place the steamer basket in the Instant Pot. ✭ Close the lid. Press ‘Steam’ or ‘Pressure Cook’ for ‘0’ mins. ‘0’ minute is perfect when you want the green beans to have a little crunch after cooking. For softer beans, increase the time to 1 or 2 minutes. ✭ As soon as the cooker beeps, manually release pressure (QR), by turning the vent to ‘Venting’ position in the DUO, and pressing down the pressure release button in the ULTRA. Remove the beans and discard the water. Step#1 Steam the green beans. Simply follow the instructions above, and steam the string beans to your desired texture. Turn on Saute mode in Instant Pot, medium heat. When it displays ‘hot’, add a teaspoon of olive oil and roast almond chips or slivered almonds for 30 seconds, stirring continuously. Remove the almonds on a plate. 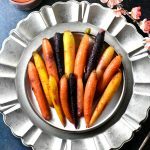 You can skip the oil and dry roast them too. Add olive oil, butter, garlic and green beans. Saute for 1 minute. Turn off SAUTE. Add a splash of balsamic vinegar and toss till all beans get coated. Serve on a platter. Top with roasted almond chips. ✭ Heat a wide skillet on medium heat. Add a teaspoon of olive oil and roast almond chips or slivered almonds for 30 seconds, stirring continuously. You can skip the oil and dry roast them too. Remove the almonds on a plate. ✭ Add olive oil and chopped garlic. Saute the garlic for 30 seconds. Add the beans, seasoning and saute for one minute. ✭ Add 1/4-1/2 cup water and cover the skillet. Cook for 4-5 minutes, or till the green beans cook to your desired texture. ✭ Remove the lid. If the water hasn’t evaporated till now, continue to saute a bit more. Add a tiny splash of balsamic vinegar and toss all the beans till they get coated in it. Turn off the heat. Serve the green beans hot, and top them with the toasted almond chips. 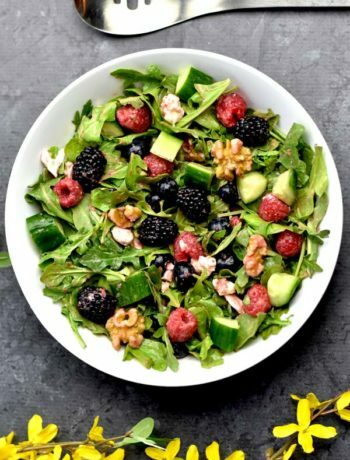 You can follow this recipe and make it with your favorite vegetable. Steam some broccoli in the same style, top it with toasted almonds and enjoy a Broccoli Amandine. Use french beans instead and serve up a classic Haricots Verts Amandine with your favorite grilled entree. 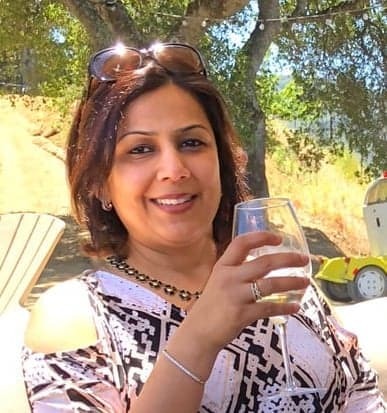 You can even saute some Tilapia or Halibut in olive oil, garlic and basil, and top it with toasted almonds. 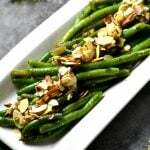 Flavorful & healthy Green Beans Almondine! 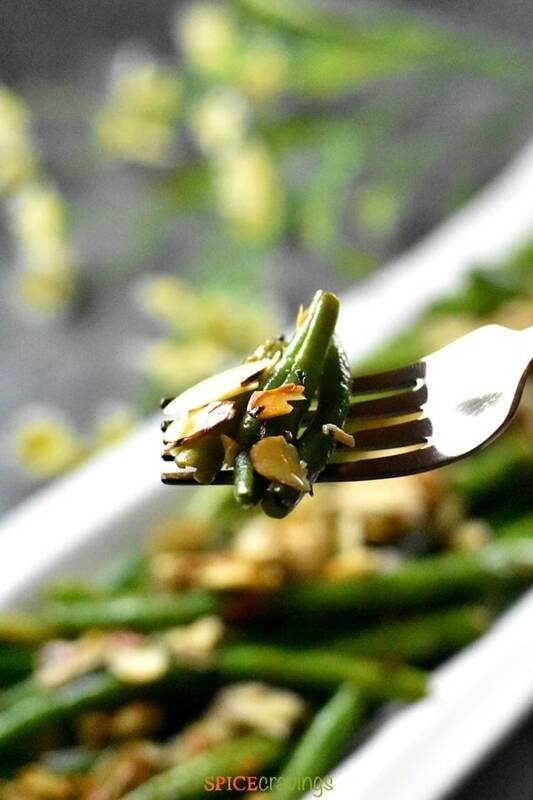 Fresh crisp string beans are sautéed with olive oil, seasoning, garlic, vinegar, & topped with toasted almond chips. 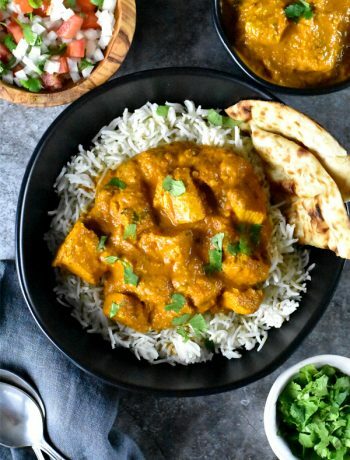 Add water in the Instant Pot inner pot. Place the washed and trimmed green beans on the steamer basket. Place the steamer basket in the Instant Pot. Close the lid. Press 'Steam' or 'Pressure Cook' for '0' mins. When the time is up, manually release pressure (QR), remove the beans, and discard the water. Add olive oil, butter, garlic, green beans, and seasoning. Saute for 1 minute. Turn off SAUTE. Add a splash of balsamic vinegar and toss till all beans get coated. Serve on a platter. Top with roasted almond chips. Heat a wide skillet on medium heat. Add a teaspoon of olive oil and roast almond chips or slivered almonds for 30 seconds, stirring continuously. You can skip the oil and dry roast them too. Remove the almonds on a plate. Add olive oil and chopped garlic. Saute the garlic for 30 seconds. Add the beans, seasoning and saute for one minute. Add 1/4-1/2 cup water and cover the skillet. Cook for 4-5 minutes, or till the green beans cook to your desired texture. Remove the lid. If the water hasn’t evaporated till now, continue to saute a bit more. Add a tiny splash of balsamic vinegar and toss all the beans till they get coated in it. Turn off the heat. Serve the green beans hot, and top them with the toasted almond chips.